Marvel Select Nightcrawler Action Figure Bamfs into Comic Shops! May 2013 - Guten tag! If you're anything like us, you learned all of your German (and Russian, and French) from comic books, and the international members of the X-Men were your professors. 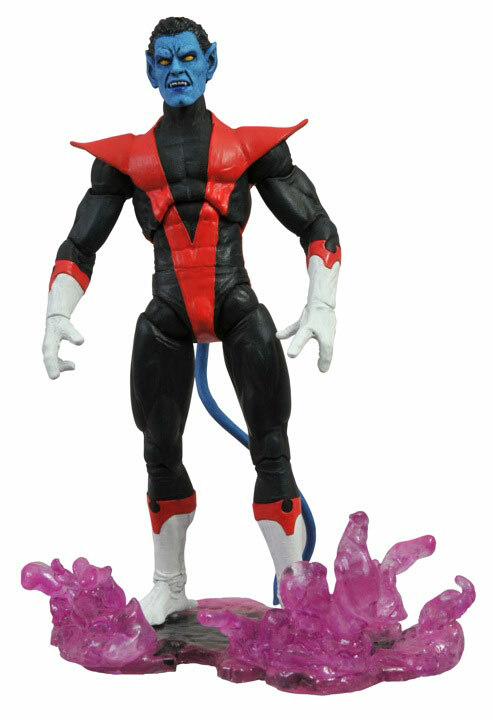 Today, Diamond Select Toys is shipping their latest 7-inch Marvel Select action figure, the teleporting German acrobat Nightcrawler, to comic shops and specialty stores across the U.S., and it is unglaublich! (That's German for "Incredible.") With 16 points of articulation, he can strike all sorts of dynamic poses, and a wire-poseable tail allows him to hang from the nearest Danger Room obstacle. The figure comes packaged with a purple teleportation base in the Select line's shelf-friendly display packaging. And it will look amazing crouching alongside the rest of your Select X-Men, (bleep) wahr? Check out some action photos below, and pick one up today! Marvel Select Nightcrawler Bamfs into New Packaging Photos! March 2013 - With the Marvel Select line delivering hit figure after hit figure, Marvel toy collectors have eagerly awaited the next comic-style Select to come out from Diamond Select Toys. And it's almost here! The offspring of a mutant and a demon, blue-furred acrobat Kurt Wagner has shown the signs of his mixed heritage since he was born, and sculptor Jean St. Jean has brought out the scarier aspects of the X-Men's resident teleporter in this new figure. 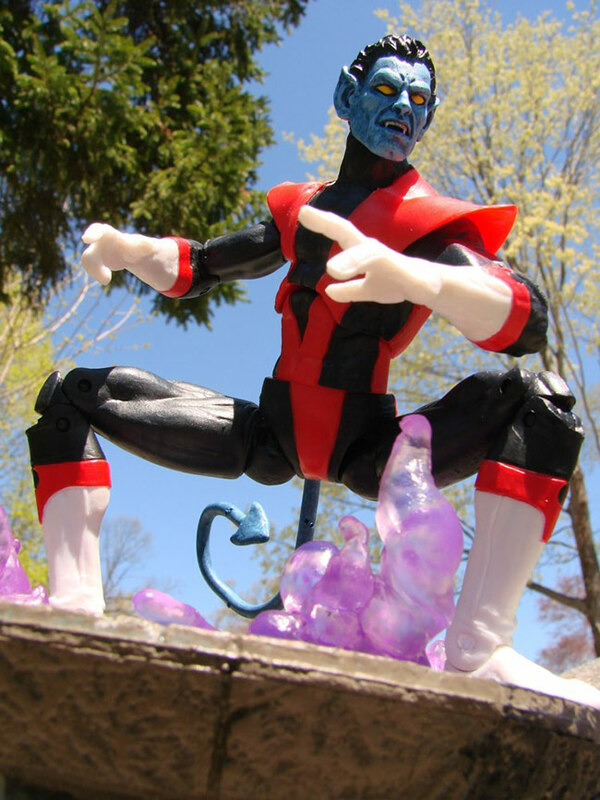 Nightcrawler stands approximately 7 inches tall with 16 points of articulation, and he comes with a "bamf" cloud base, representing the purple cloud he leaves behind when he teleports. Check out the new packaging below and pre-order him from your local comic shop, specialty store or your favorite online retailer! Shipping in April!